Do Title Loans Go on Your Credit? 1: Do Title Loans Affect Your Credit? Individuals in the market for a car title loan often have concerns about their credit score and report. Most of the time, borrowers apply for car title loans because of their credit. Car title loans work a little differently than loans that are more conventional. It is important for potential borrowers to understand not only why they are applying for a car title loan, but also what they expect the loan to do for them. Paying close attention to your credit score and report is essential. A good score strengthens your purchasing ability, while a poor credit score can place unneeded challenges in your way through life. Because car title loans are reported on an individual’s credit report, it’s crucial for potential borrowers to understand how these will function before moving forward. Why Get a Car Title Loan? Car title loans are an effective way to get cash quickly. Car title loans are a means to obtain cash for emergencies and other unexpected events. Regardless of what the event is, these loans can put the needed money in your hands quickly. However, car title loans come with a price. As a potential borrower, you should thoroughly research the responsibilities that come with a car title loan. It is recommended to do extensive research and even talk with potential lenders before making your decision. Do Title Loans Affect Your Credit? Yes, it does affect one’s credit. To understand why car title loans affect the borrower’s credit, you have to understand the nature of these loans. Car title loans are the same as all types of loans. Lenders rely on the borrower’s credit history and his current income to determine his ability to repay the loan. Like any other loan, car title loans are recorded on an individual’s report. As such, the responsibility demanded by these loans needs to be taken seriously. They are a marker of your financial health. The handling of repaying a car title loan is a serious matter. Keeping up payments is essential. Delinquent or late payments are not only are recorded on your credit report, but also can result in a car repossession. Similarly, the successful completion of the loan is recorded as a positive mark on your credit report. However, it does not have the same impact as completing a home loan. As with any loan, research is required. Individuals in the market for a car title loan should carefully consider their options, as well as their monthly budget. Car title loans should not be rushed or entered into lightly. A good and reputable lender will make sure you understand this before applying for a car title loan. 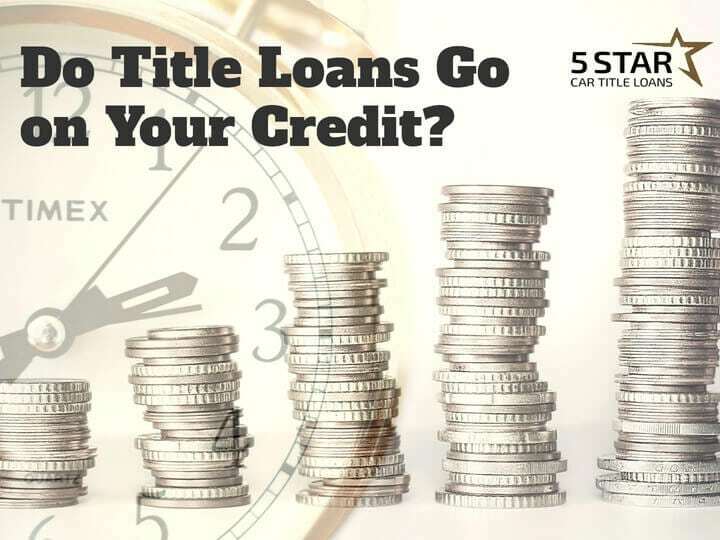 Call us now for more information about 5 star Car Title Loans services OR Apply Online! Casey Davis has been writing about finance, investment, and economics for 10 years. He has taught basic economics courses, as well as personal financial literacy workshops during his time as an educator. – Loans made or arranged pursuant to a California Financing Law #603J988 5 Star Car Title Loans (5 Star Loans, Inc., DBA). Title Loans in CA are Installment Loans. Our minimum loan amount is $2600. – 5 Star Car Title Loans may act as the broker for the loan, and may not be the direct lender. All loan applications are subject to meeting our credit criteria, which includes applicant’s ability to repay the loan. – 5 Star Car Title Loans may check applicant’s credit history upon applicant’s authorization. Bad Credit Loans is a term used to describe loans given to applicants with bad credit history. Car title loans are type of Collateral loans.